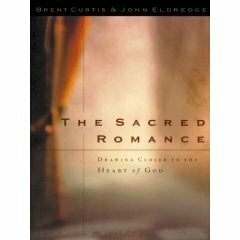 My friend Amy Jo and I are reading The Sacred Romance-Drawing Closer to the Heart of God, a book originally published 11 years ago by authors Brent Curtis and John Eldridge. We're going to be sharing our thoughts about it here on this blog for a few weeks. If you have a copy, pick it up and read it and tell us what you're getting from it, too! The Sacred Romance strikes a chord in us because more than at any other age, we have lost touch with our hearts. We have left that essential part of ourselves behind in the pursuit of efficiency, success and even Christian service. If you long for something more, even if you don't know what that something is, then open the pages of this profound book. Before long you will find yourself eagerly turning the pages to find out what happens next. The Sacred Romance is the story of our lives; it is God's story. It is His invitation to experience His unfathomable love for us. We hope you'll give us your input! This book is doing open heart surgery on me–and I'm only through the first chapter! If you really need an awakening, pursue this journey.